We at Holiday Ark know that your pets are a very special part of your family, and we treat them that way; with respect, love, and care. Our excellent door to door pet collection and delivery service, namely 'Bark n Ride' and 'Meow n Move' is ideal for pet owners who do not have a suitable method of transport and need to take their pets to the vets or any other destination. 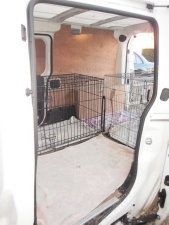 Your pet will be transported safely using crates or a pet carrier, ensuring maximum safety throughout the journey. You may prefer to keep your car clean and free from pet hair or you may just not have the time to take your pet where it needs to go. You may not drive and taxi drivers can be very reluctant to carry pets in their vehicles. We provide a pet transport service where we can help you with home relocation within Oxford and Oxfordshire, take your pet to and from the vet, cattery, kennels, groomer or maybe just to a friend's or relative's home. Double rate is applied for Christmas Day, Boxing Day, New Years Day and Bank Holidays that fall within the same period. A Holiday Ark dog walker will never tranpsort more than four dogs at any one time giving your pet their own individual space or crate ensuring safe arrival to a dog friendly walking area. Your pet may also be walked from their own home. Dogs are not transported in any other part of the vehicle.